Academy Professor Petri Toiviainen’s research team at the University of Jyväskylä, Finland, has set out to understand what happens in the brain when listening to music. Their experiments utilize Magnetic Resonance Imaging (MRI) and a supercomputer cluster provided by the Finnish research and education network CSC. Petri Toiviainen has played music since childhood and studied physics at university. In his work, he combines his passions for music and the natural sciences. His multidisciplinary approach mixes musicology, psychology, computational data analysis and neuroscience. According to Toiviainen, his research project “Dynamics of Music Cognition” will have effects not limited to music alone. The work of Toiviainen and his team will be another contribution to the huge ongoing research effort to understand how our brains process information in general. As an example, his research team has studied musicians and non-musicians, looking for differences in brain activity, while the test persons were listening to the same kind of music. Three pieces of music were chosen: a prog metal song by Dream Theater, “Stream of Consciousness”, “Adiós Nonino” by tango composer Astor Piazzolla and a piece of classical music, Igor Stravinskys “Rite of Spring”. The research shows, that music listening activates musicians’ brains in a more symmetrical manner than non musicians’, showing a more efficient communication across brain hemispheres in musicians. The reason for this seems to be, that the demands of musicianship, such as bimanual coordination of finger movements, requires greater connectivity between motor regions of the two cerebral hemispheres for the speed and efficiency necessary to music performance. The findings emphasize, that the specific posture and kinematics involved in instrument playing may be crucial factors in shaping the brain responses during music listening. Interestingly, statistical analyses also reveal, that keyboardists’ brain responses are more symmetrical than those of violin players. Piano playing requires a more mirrored and synchronized use of both hands and fingers than in violin playing, which may be guiding these differences, explains prof. Petri Toiviainen. The findings have broader implications for a better understanding of how experience in one modality (in this case, motor control) can drive changes in the neural processing in another modality (listening). 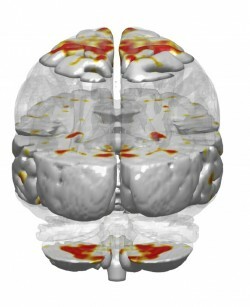 The researchers use CSC’s Taito supercluster to analyse the collected fMRI data. “We first tried analysing the data with our own laptops – but they crashed immediately. When we turned to Taito we realised that we now had far more powerful computing resources at our disposal,” says Toiviainen. “We revised our original plans and came up with something more ambitious. We’ve now been able to achieve things that would’ve been impossible without Taito.